If you were ever wondering what you could do with that $11M you've got lying around, we're here to help. Option A: a five-bedroom apartment on the east side of Manhattan, complete with river views and 10'6" ceilings. Or, Option B: the Christmas tree that just rose in the lobby of the Emirates Hotel in Abu Dhabi. Standing 42 feet tall, the merry holiday plant is dripping in 180 baubles consisting of diamonds, pearls, emeralds, and rubies. The most expensive piece alone costs $1M. What's that about it being the most wonderful time of the year? As you can imagine the tree is getting a lot of attention and not really the good kind. Most find it in bad taste and a totally inappropriate show of wealth at a time when most Christians focusing on giving. Wait! Stop the presses! What's this? An apology? An actual admission of lack of taste? This really is a Christmas miracle! ABU DHABI, United Arab Emirates – An Abu Dhabi luxury hotel that boasted an $11 million Christmas tree decorated with gold and gems admitted Sunday it may have taken the holiday spirit a bit too far. 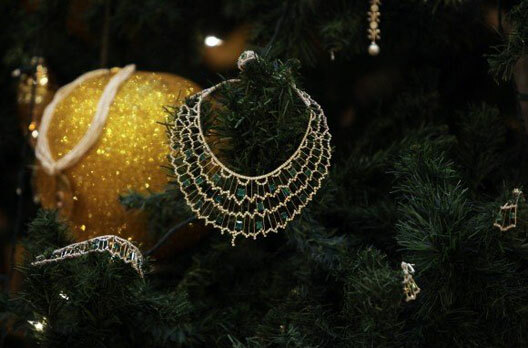 A statement from the Emirates Palace hotel said it regretted "attempts to overload" the Christmas tree tradition by adorning it with premium bling including gold, rubies, diamonds and other precious stones from a hotel jeweler. The statement was a rare bit of reflection on the Gulf's ethos of excess. The tree was unveiled last week with full fanfare in a hotel that features its own gold bar vending machine and a one-week $1 million package that includes private jet jaunts around the Middle East. The hotel regrets "attempts to overload the tradition followed by most hotels in the country with meanings and connotations that do not fall in line with the (hotel's) professional standards," said a statement carried on the state-run news agency WAM. "The hotel is just a venue for exhibiting the tree," the statement said. 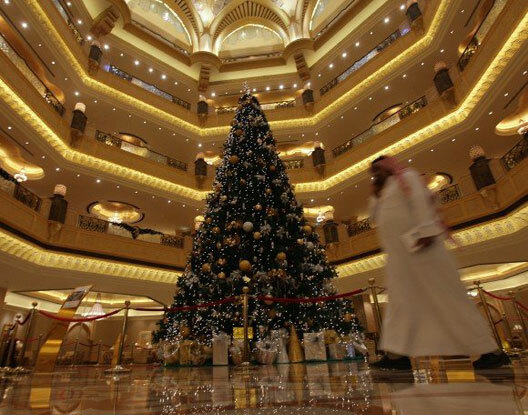 The hotel also claimed the tree was not a stunt, but rather an effort to boost the holiday mood for its guests based on the United Arab Emirates' "values of openness and tolerance." Ah yes the ol' 'the jeweler made me do it' excuse. Oh well guys, here's an A for effort. You can try again next year. Higher me as a Christmas consultant - I'm going to suggest tinsel and popcorn strings! This year the calendar has been packed with parties and then camaraderie amongst us who are far from home really does make it feel like the season! The festive spread left nothing to be desired. Baking cookies for Fiona's Christmas party. The result of hours in the kitchen! (Plus the 100 or so cookies off camera). Matt can't help himself from creating in the kitchen. He whipped up a Jack Daniel's gravy for our roast. Santa and his reindeer brought deviled eggs! My contribution to our White Elephant gift exchange. Of course Pennsylvania-bred present. My gift - two pens: a man in candura and a woman in burqua. Nick models his take - a UAE hat. Fiona combines several gifts for the perfect holiday outfit! What is Matt doing to little Molly? We rarely get stars in the overcast Dubai evenings, but with tickets to the Dubai International Film Festival's screening of 'The Way Back' last night, we finally got to see some stars! As we huffed and puffed to the entrance of the theater arriving at 7:57pm for an 8:00pm (traffic!) we strode towards the doors just to have a velvet rope thrown up at the last minute blocking our path. When we asked anxiously what the hold up was, a polite usher said "You can go once they pass". They? Who is they? That's when I turned to see Ed Harris, Colin Farrell, and Jim Sturgess (of 'Bringing Down the House' fame) right in front of us! Turns out by running late we arrived just as the 3 stars of the movie were walking the red carpet. Serendipity! We had ringside seats for all the interviews and then walked the carpet behind the boys into the theater! The director Peter Weir (Witness, Dead Poets Society, Green Card, The Truman Show and Master and Commander) was even in attendance to introduce the film. Click here to learn more about 'The Way Back.' It was a great night and it really showed that DIFF is putting itself on the map! The Madinat Arena all decked out for DIFF. Checking out the program before the lights go down. Peter Weir introduces the film. The girls go crazy for Colin. The boys arrive with the Dubai entourage for the screening. The opening act of the screening. While many people back home are enjoying seasonal fare like the creamy, frothy eggnog, we here in Dubai are enjoying our own creamy, frothy drink - the "white gold" of the desert - camel's milk! Widely drank in the region and even one of the staples mentioned in the Koran, camel's milk is one of the essential ingredients for survival in the Bedouin camps. Now you can find it stocked in every grocery store and even flavored with banana, chocolate and strawberry. A lot people tout the health benefits of the milk and insist that it can cure cancer, ease asthma and treat diabetes. So it was only fitting, in Dubai fashion, that we make a competition out of finding the best camel's milk around! The three-day Halab competition is open to Asayel, or pure-blood, camels from the UAE or Oman and dark-skinned Majahims that are originally from Najd in Saudi Arabia. There was no place for mixed breed camels, and the owners must have taken an oath: "I swear by Almighty God that this camel is rightfully mine and it is pure-bred." On the first day of the competition, more than 80 Asayels were shortlisted to 15 for the final round the next morning. Deri'a, a tan-coloured camel owned by an Emirati, came first for producing 11.7 kilograms of milk. Omani-owned Hamra was second, with another Emirati camel third. Almost 90 Majahims went through a similar process, the field being narrowed down to 15 before a top 10 was chosen. At the end of the three-day competition an Emirati-owned camel came out tops in the Majahms catagory too! Looks like we've got some award winning camel's milk here in the UAE. Anyone want to put orders in for Christmas? What To Do When Your Government Announces a Four Day Surprise Holiday? "Phuket" Lets Go to Phuket! To begin, the 'h' is silent, ahem. But that's about the only thing that's understated about "Pooket". With a surprise four-day holiday sprung on us at the last minute: UAE National Day meets Hijri New Year (welcome to year 1432 on the Islamic calendar) we took the chance to feed our travel addiction. The island of Phuket, Thailand has long been heralded in this part of the world as one of the "must see" destinations in Southeast Asia, so we went to go see what all the fuss is about. Now we can see why. It's got something for everyone. Whether you want to chill out on the beach in Bang Tao, go hiking around mountains in Siray Bay, or get into some serious naughty debauchery in Patong - the island caters to all types of vacation seekers. We rented a car (barely survived some 'driving on the wrong side of the road' issues) and took all of it in. The Thais believe that life isn't worth living unless you have "sanuk" - a sense of joy or fun in what you are doing, regardless of what it is. The island of Phuket didn't make sanuk hard to find! A gorgeous sunset over Siray Bay greeted us on arrival. The back lit statue of the seated golden Buddha that sits on the mountain top. When this guy landed on Matt's shoe, he knew just what to do. It is Thailand after all. The Promthep Clock Tower in old Phuket town was built in during WWI in 1914, but the ship that was to deliver it's clock sank and it stood without a clock for 62 years! In 1976 the local Lions Club finally donated one. There are a lot of brilliantly painted buildings downtown. As always the motorbike is an essential transport. We had lunch over looking this outcropping on Patong Beach. While waiting for lunch I went crabbing in the tidal pools. There were tons of crabs but this was the only one I was brave enough to pick up! The Ironman Triathlon was held this weekend on the island. The first guy past the finish line was from the USA! We got the chance to take out some beautiful horses on the beach! Matt took off at a full gallop with this beauty. The cannonball head isn't my best look, but it's hard to care when you are looking at this! ...and a kiss from a baby elephant. Just like a human 3 year old, this toddler loves to play in the sand! I think I'm in love! His name is Lailai. On our last night we set off a floating lantern into the night sky. The Thais believe that this symbolizes casting off your troubles and letting them float away. Don't worry, I don't know what most of those words mean either. What I do know is that a bunch of French guys came in and erected a white pyramid-shaped spaceship on the lawn in front of our building. Apparently to inspire fans of the Louis Vuitton WSTA Sailing Trophy (which culminated in a Dubai regatta), this mystical pyramid just sat there for three weeks tempting us to go inside and travel to another dimension. When we did, we weren't disappointed at all - twelve sailing ship decks are inside, suspended over water pools and bathed in blue light, each with four LCDs displaying looped video of water rushing by. Playing all around was a white noise "waves crashing" CD, and the effect was a bit overwhelming. Seriously, I couldn't tell if Louis Vuitton was promoting sailing or time travel. Either way, I think I'm supposed to buy my wife a purse. On this 39th National Day commemorating the unification of the seven United Arab Emirates, we had a front row view. The trick is, the UAE is truly ahead of the world - so much so, that they held the Dec 2nd National Day celebration on December 1st! Lucky for us - we have an all glass living room and a long range lens, so when they held the celebrations in the park at the base of the Burj Khalifa we didn't miss a thing! top governmental agencies, and community leaders. Of course, the fireworks show was in the tradition of the UAE. Cannons were placed around the Burj Khalifa, along the lake, on the top of surrounding hotels, and Dubai Mall itself. We finally made it to the top of the world! After opening in January this year, we've done nothing but stare at the tallest building in the world in our backyard, while we waited for my parents to arrive so we could all go to the observation deck together. Finally 11 months later, the moment had arrived to join the Guinness Book of World Records and become one of the many visitors who have been to the worlds tallest observation deck. The deck is on the 124th floor and the elevator gets you there in a little under one minute - which is pretty amazing. The building has 36 more floors above where we could go, for a total of 160 floors. Floor was 160 is residential -can you imagine? I don't consider myself afraid of heights, but even I was afraid to get near the windows! The tunnel ride from Dubai Mall to the base of the Burj is illuminated with a ton of projectors which tell the story of Dubai. Welcome to the base of the Burj. The bird's eye view is meant to look like this...a cross section of the hymenocallis or spider lily, a desert flower. The view looking East down Sheikh Zayed road. This is the Dubai financial and business center. Great view of Sheikh Mohammad's palace. Looking East towards our neighboring emirate Sharjah. There's still 36 floors above us! The iconic Emirates towers, one of my favorite buildings in Dubai - I used to work on the 49th floor. Taking in the view. Can I see Iran from here? Glad to enjoy the moment with Mom and Dad! The view looking West towards the Marina. You can only slightly see the Burj Al Arab - we had a hazy day! Looking down our our neighborhood. Our building is in the upper right hand corner. The top of Dubai Mall, Souk al Bahar, the Palace hotel and you can see the Dubai fountain mechanisms. It's hard to believe that just last weekend we visited the world record holder for the tallest building for the last 4,000 years! The Great Pyramid at Giza held the title for 4 millennia before more modern structures took over. Let's see how long the Burj Khalifa holds on!